Osmotic stress is a major abiotic stress limiting crop production by affecting plant growth and development. Although previous reports discovered that methane (CH4) has a beneficial effect on osmotic stress, the corresponding downstream signal(s) is still elusive. 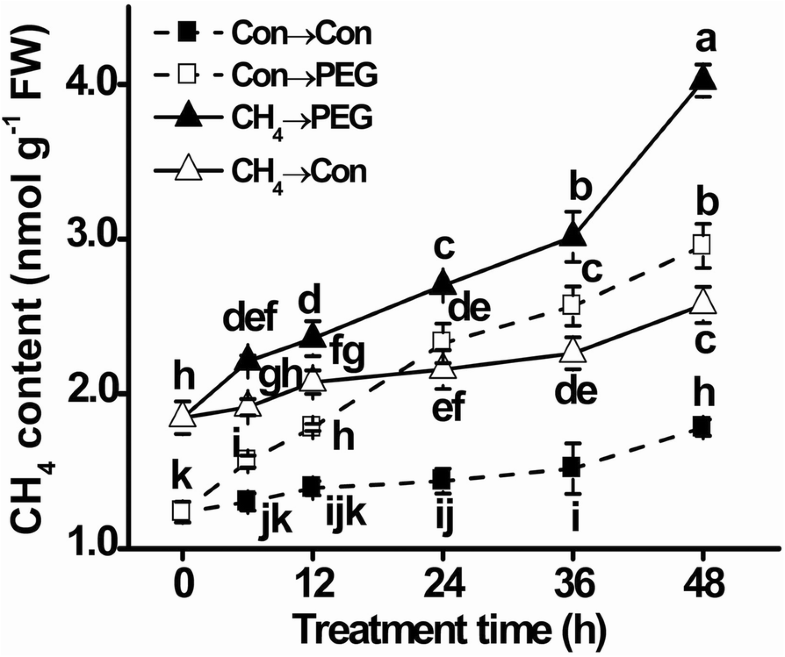 Polyethylene glycol (PEG) treatment progressively stimulated the production of CH4 in germinating mung bean seeds. 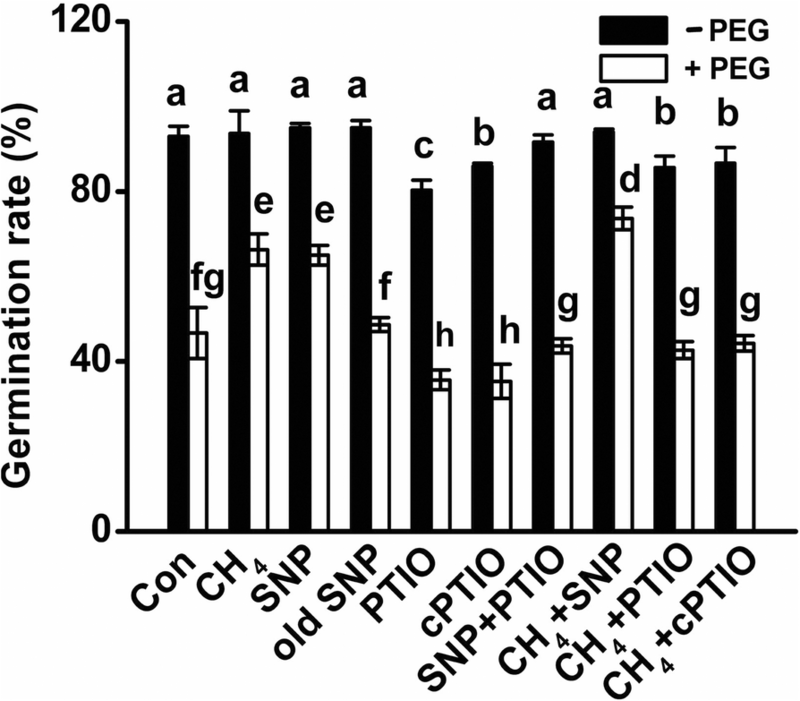 Exogenous CH4 and sodium nitroprusside (SNP) not only triggered nitric oxide (NO) production in PEG-stressed plants, but also alleviated the inhibition of seed germination. Meanwhile, amylase activity was activated, thus accelerating the formation of reducing sugar and total soluble sugar. Above responses could be impaired by NO scavenger(s), suggesting that CH4-induced stress tolerance was dependent on NO. Subsequent tests showed that CH4 could reestablish redox balance in a NO-dependent fashion. The addition of inhibitors of the nitrate reductase (NR) and NO synthase in mammalian (NOS), suggested that NR and NOS-like protein might be partially involved in CH4-alleviated seed germination inhibition. In vitro and scavenger tests showed that NO-mediated S-nitrosylation might be associated with above CH4 responses. Together, these results indicated an important role of endogenous NO in CH4-enhanced plant tolerance against osmotic stress, and NO-regulated redox homeostasis and S-nitrosylation might be involved in above CH4 action. Mung bean (Vigna radiata L.) is consumed in large quantities in Asia due to its desirable taste and high nutrition value . It is a good source of vitamins (A, B, C and E), minerals, and proteins with essential amino acids . Mung bean has high medicinal function of curing diarrhea, headaches, edema, and eye problems . However, the limited plant growth and crop production of mung bean widely exist because many regions of Asia are under osmotic stress. Osmotic stress means that the water available potential is limited. Thus, sensing and signaling during water deficit stress might play key roles in plant water status, and bring about quick changes in gene expression . Generally, polyethylene glycol (PEG)-6000 is considered as an applicable solute because of its properties of mimicking osmotic stress, which results in the inhibition of plant growth and development . The water deficit caused by drought or osmotic stress could usually result in many changes in plant physiological processes [5, 6]. One of these changes is associated with the overproduction of reactive oxygen species (ROS) and thereafter oxidative damage, both of which have impacts on peroxidation of membrane lipids and the loss of plasma membrane integrity [7–9]. More importantly, perception and transduction of the stress-induced gaseous signaling molecules, including nitric oxide (NO), hydrogen sulfide (H2S), carbon monoxide (CO), and hydrogen gas (H2), are the major events [10–15]. Among these, NO is a multifunctional molecular gas, which can cross biological membranes . In plants, it is considered as a regulator in response to various stresses, such as drought and osmotic stress [17, 18], salinity , heavy metal exposure , UV-B radiation , nanoparticles phytotoxicity [21, 22], and biotic stress [23, 24]. Biosynthesis of NO is catalyzed by nitrate reductase (NR), a well-known route of reductive reactions, and nitric oxide synthesis (NOS)-like biochemical pathway [25, 26]. Previously, there are more evidence showed that NO could modulate ROS generation, which is always accompanied by oxidative stress, to keep redox homeostasis and decrease oxidative damage [18, 27]. 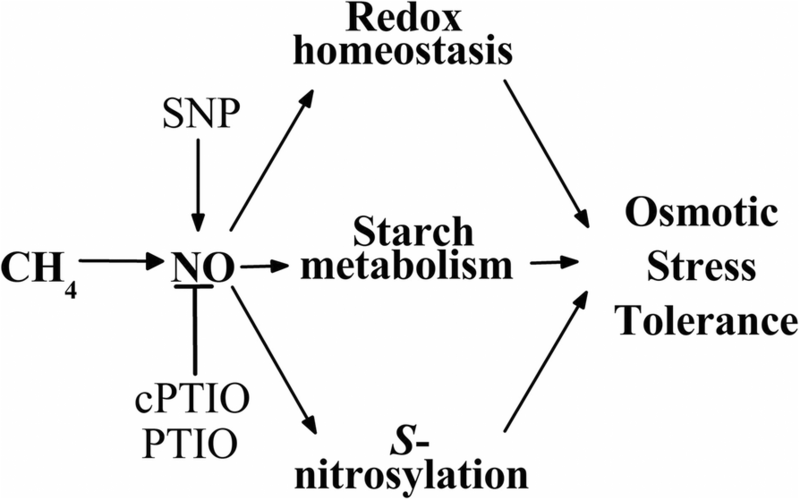 Specific plant proteins involved in metabolism, stress responses, and redox homeostasis, have also been identified as possible targets for S-nitrosylation, one of NO-dependent post-translational modifications [28, 29]. Methane (CH4) is not only the main element of nature gas and flammable ice, considered as a kind of clean fuel, but also have effects on anti-oxidative, anti-apoptotic and anti-inflammatory in animals [30–32]. It was further reported that formation of non-microbial CH4 in many different plant species is obviously increased by osmotic stress , high temperature [33, 34], UV-B radiation [33–35], physical injury . Although the emission of CH4 from plant have been discovered for an extended period, the CH4 biosynthetic pathways related to CH4 formation and releasing, and its biological functions are still elusive . Recent results showed that CH4 was able to induce cucumber adventitious rooting of hypocotyl cuttings (primary roots removed) [38, 39]. Similar to the response of NO, we proved that CH4 can alleviate salinity stress and copper stress in alfalfa plants [8, 40]. Recently, the alleviation of osmotic stress in maize seedlings by CH4 was confirmed, and the involvement of sugar and ascorbic acid metabolism was preliminarily elucidated . However, the cross-talk between CH4 and NO signaling in plant tolerance against osmotic stress is still elusive. To resolve above scientific question, in this study, time-course analysis of PEG-induced CH4 production was firstly determined. Considering that CH4 could form an explosive mixture with air, methane-rich water (MRW) was used to investigate the function of endogenous CH4 in plants [8, 38, 39]. Using this experimental approach, we provided pharmacological, physiological, and biochemical evidence to prove that CH4 could alleviate PEG-induced osmotic stress by modulating redox homeostasis and starch metabolism in mung bean. Importantly, this biological function was associated with the homeostasis of NO, a key cell signaling modulator [14–16]. The involvement of NO-triggered protein S-nitrosylation was also preliminarily suggested. Above results thus open a new window for CH4 signaling in plant kingdom. All chemicals were purchased from Sigma (St Louis, MO, USA) unless otherwise stated. Polyethylene Glycol-6000 (PEG-6000) was purchased from Guangdong Guanghua Sci-Tech Co., Ltd, China, and is generally used to imitate osmotic stress. Sodium nitroprusside (SNP) was used as a well-known NO-releasing compound. The utterly light-inactivated SNP solution (old SNP) was used as a negative control. 2-(4-carboxyphenyl)-4,4,5,5-tetramethylimidazoline-1-oxyl-3-oxide potassium salt (cPTIO) was used as a scavenger of NO. Another scavenger of NO, 2-phenyl-4,4,5,5-tetramethylimidazoline-1-oxyl-3-oxide (PTIO) purchased from TCI company, was also used. Tungstate, a NR inhibitor, and Nω-nitro-L-Arg methyl ester hydrochloride (L-NAME), a mammalian NOS inhibitor, were used, respectively. In this study, the pilot experiments were carried out to determine the suitable concentrations of above chemicals with maximal responses. The CH4 gas (99.9%, v/v) from a compressed gas cylinder (Nanjing Special Gas Co., China) was bubbled into 500 ml distilled water with a rate of 160 ml min-1 for least 30 min at 25°C, thus reaching a saturated level. The corresponding methane-rich water was then immediately diluted with distilled water to different saturation required. The contents of CH4 in fresh methane-rich water (10, 50 and 100% saturation) were 0.13, 0.65, and 1.30 mM, respectively, and maintained at original concentration for at least 12 h.
For determining endogenous CH4 content, plant samples were treated according to the method described previously . CH4 content was estimated using an Agilent 7820 model gas chromatograph (GC; Agilent Technologies Inc., USA) equipped with a flame ionization detector and a Porapak column (1/8 inch, 8 foot). The column was held isothermally at 70°C. The injection and detector temperature was adjusted to 200 °C and 300 °C, respectively. Nitrogen (N2) was used as the carrier gas, and air pressure was 0.5 MPa. The GC was calibrated using a standard CH4 mixture (2.0 ppm CH4 in N2; Nanjing Special Gas Co., China). For nitrogen (N2) and argon (Ar) application, pure N2 and Ar gas from a gas cylinder (99.99%, Nanjing special gas Co., Ltd) were respectively bubbled into distilled water at the same rate as CH4 (160 ml min-1) for at least 30 min to obtain the same O2 concentration as methane-rich water (containing 1.3 mM CH4). The healthy seeds of mung bean (Vigna radiata L. cv Jinlv No. 7) were selected and surface-sterilized with 5% NaClO for 10 min, followed by totally washed with distilled water and then dried. These seeds were presoaked with 20 ml of culture solution containing the indicated concentrations of CH4, N2, Ar, SNP, old SNP, PTIO, cPTIO, tungstate, and L-NAME, alone or their combinations. Then, these seeds were transferred to another Petri dishes and incubated on filter paper for 12 h at 25 °C in the darkness following the procedure described previously [42, 43]. The equal volume of 20% PEG-6000 was applied to mimic osmotic stress. All seeds were germinated in a growth chamber at 25°C with darkness. Treatment with distilled water was regarded as control (Con). After the indicated time points, the germinating seeds were rinsed with distilled water for three times. Then, the samples were harvested and used immediately, or frozen in liquid nitrogen and stored at -80°C for further analysis. Germination test was carried out with three independent experiments and at least three replicates for each. Each independent set of experiments was 120 seeds. Every Petri dish contains 40 seeds. After the indicated pretreatments followed by PEG-6000 stress for 48 h, germination rate (%) was recorded. Seeds were regarded as germinated when the emerging root was approximately the length of the seeds. Additionally, fresh weight (FW) and dry weight (DW) were detected after various treatments for 48 h.
According to previous report , about 200 μm transversal sections, which were obtained from root tips about 1 cm, were cut out at the indicated time points. These sections were incubated with 7.5 μM 4-amino-5-methylamino-2′,7′-difluorofluorescein diacetate (DAF-FM DA; a fairly specific NO fluorescent probe; prepared in 20 mM HEPES buffer, pH 7.8) for 10 min at 25°C in the darkness. Subsequently, the sections were washed three times with the same buffer for 15 min each, and monitored by laser scanning confocal microscopy (LSCM). The DAF-FM DA signal (excitation at 488 nm; emission at 500-530 nm) was captured as green fluorescence. All images were visualized using UltraVIEW VoX (PerkinElmer, Waltham, America). At least six individual samples were randomly selected and measured per treatment. The bright-field images corresponding to the fluorescent images were also shown. Fluorescence of NO production in root tissues (about an area of 150,000 μm2) was quantified based on 20 overlapping confocal planes of 2 μm each using the Volocity Demo software. Besides, endogenous NO content was detected by Griess reagent assay  with some modifications. About 2000 mg samples were homogenized in a mortar with 50 mM cool acetic acid buffer, and then centrifuged. After various treatments, samples were pre-incubated in 100 μM cPTIO, a specific scavenger of NO, for 1 h, were regarded as the blank control. The supernatant was collected and reacted with Griess reagent for 30 min. Absorbance was assayed at 540 nm, and the NO content was calculated by in comparison with a standard curve of NaNO2. For determining endogenous ROS, about 200 μm transversal sections from the root tips were incubated with 10 μM 2’,7’-dichlorofluorescein diacetate (H2DCF-DA, a fairly specific ROS fluorescent probe)  in 20 mM HEPES buffer (pH 7.8) for 10 min. The H2DCF-DA signal (excitation at 488 nm; emission at 500-530 nm) was captured as green fluorescence, and monitored by LSCM. After various treatments, whole roots were rinsed with distilled water for three times, and then dried with filter papers and immediately soaked in the specific reagents. Histochemical detection of lipid peroxidation was performed with Schiff's reagent . All stained roots were observed under a light microscope (model Stemi 2000-C; Carl Zeiss, Germany), and photographed (Powershot A620, Canon Photo Film, Japan). Lipid peroxidation was detected by measuring the concentration of thiobarbituric acid reactive substances (TBARS) as described previously . Briefly, about 1000 mg of germinating seeds was homogenized in a mortar with 10 ml solution containing 0.25% 2-thiobarbituric acid (TBA) and 10% trichloroacetic acid (TCA). After heating at 95 °C for 30 min, the mixture was quickly cooled in an ice bath, and centrifuged at 10,000 × g for 10 min. The absorbance of the supernatant was read at 532 nm and corrected for unspecific turbidity by subtracting the absorbance at 600 nm. The blank was 0.25% TBA in 10% TCA. The results were expressed as nmol g-1 fresh weight (FW). For detected reducing and soluble sugar contents, α-amylase and total amylase activities, the germinating seeds were homogenized in a mortar. Reducing sugar and soluble sugar contents were estimated following the previous methods . α-amylase and total amylase activities were detected according to the methods described previously . For protein extraction, germinating seeds were homogenized in a mortar with liquid nitrogen to fine powder, and then re-suspended in HEN buffer containing 250 mM Hepes-NaOH (pH 7.7), 1 mM EDTA, and 0.1 mM protease inhibitor cocktail, and centrifuged at 13,000 g for 20 min at 4°C. The supernatants were transferred to clean tube stored at 4°C for Western blotting analysis. 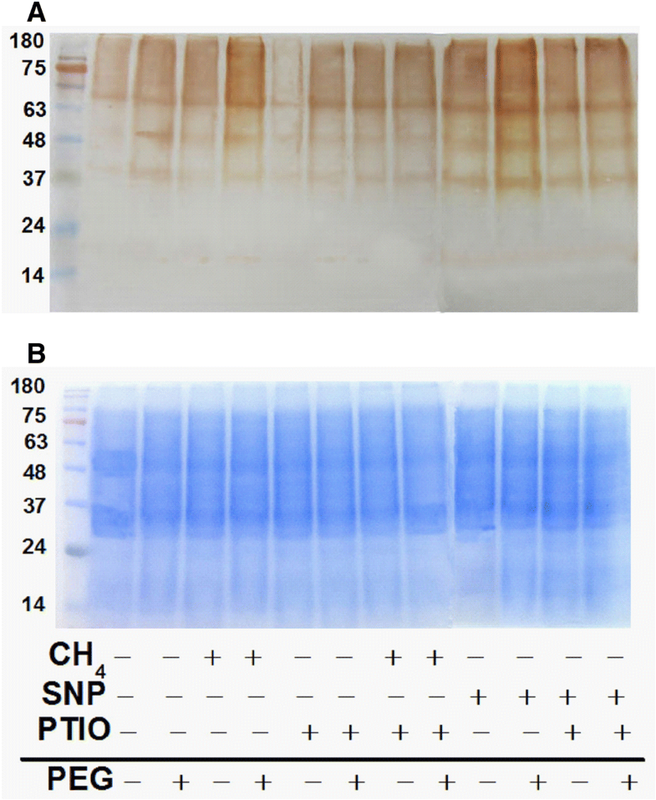 According to the previous protocols , analysis of protein S-nitrosylation was carried out. The biotin-labeled protein samples were separated under non-reducing conditions by 12% SDS-PAGE for 1.5 h at 120 V. After blotting onto a polyvinylidene difluoride (PVDF) membrane, anti-biotin antibody (HRP; Abcam antibodies, Cambridge, UK) was added at 1:10,000 dilution for 1 h at room temperature. Meanwhile, as a loading control, parallel sets of gels were stained with colloidal Coomassie blue to confirm that the loaded proteins were equal amounts. All date expressed are the mean values ± SE of three independent experiments with at least three replicates for each. Statistical analysis was performed using SPSS 16.0 software. For statistical analysis, one-way analysis of variance (ANOVA) followed by Duncan's multiple range test (P < 0.05) was chosen. In order to evaluate whether osmotic stress could induce the production of CH4, CH4 content was analyzed in germinating mung bean seeds by gas chromatography (GC). Fig. 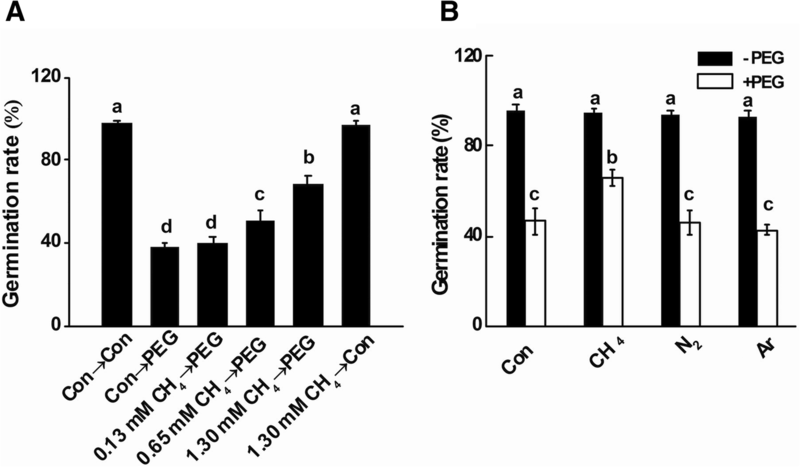 1 showed that, in comparison with control samples, PEG stress resulted in a gradual and significant increase in CH4 production during a 48 h period of treatment, suggesting the possible role of endogenous CH4 in osmotic stress responses. To characterize the effect of CH4 on osmotic stress, culture medium containing different concentrations of CH4 (ranging from 0.13 to 1.30 mM) were applied. As showed in Fig. 2a, the inhibition of seed germination was observed in PEG-treated sample. Further results illustrated that CH4 pretreatment was effective in reversing the negative impact of PEG stress on seed germination in a dose-dependent manner, with 1.30 mM in particular. Results shown in Fig. 1 further revealed that 1.3 mM CH4 pretreatment for 12 h (0 h; the beginning of osmotic stress) brought about a 49.2% increase in CH4 production. Subsequent stress (CH4→PEG) aggravated CH4 production, compared to stress alone. Based on the above findings, 1.3 mM CH4 was used in the subsequent experiment. To rule out the possibility that CH4-promoted role might be partly due to hypoxia, culture medium containing nitrogen gas (N2) and inert gas argon (Ar) was subsequently applied. As expected, unlike the beneficial response of CH4, both N2 and Ar failed to alleviate PEG-triggered seed germination inhibition (Fig. 2b). It was also noticed that the application of sodium nitroprusside (SNP; a NO-releasing compound) (Fig. 3), brought about the significant alleviation in the seed germination inhibition caused by PEG stress. Above response was not observed in the pretreatment with old SNP solution (a negative control of SNP, containing no NO, but ferrocyanide, nitrate and nitrite), suggesting that the beneficial role of SNP was NO-dependent. To investigate the possible involvement of NO in above CH4 response, two specific scavengers of NO, 2-phenyl-4,4,5,5-tetramethylimidazoline-1-oxyl-3-oxide (PTIO) and 2-(4-carboxyphenyl)-4,4,5,5-tetramethylimidazoline-1-oxyl-3-oxide potassium salt (cPTIO), were used. 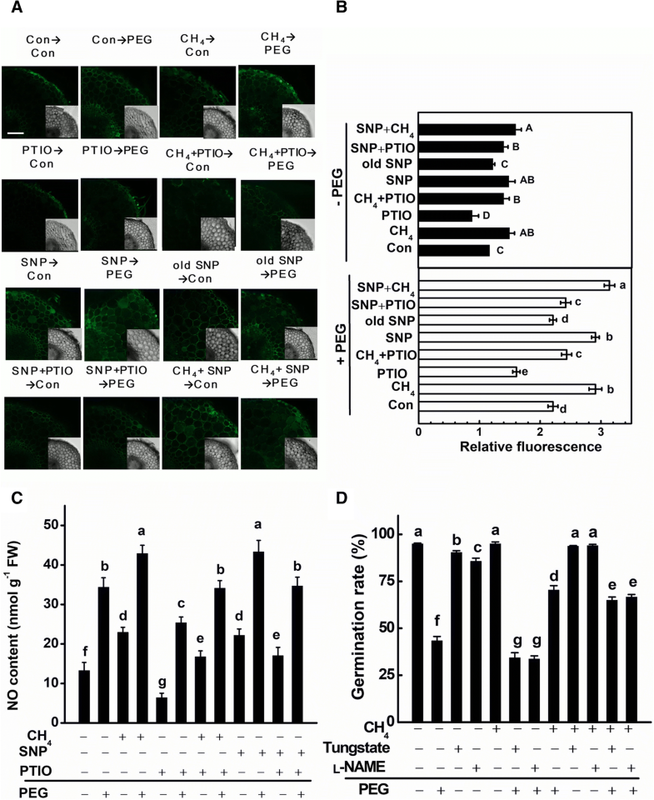 Interestingly, we observed that CH4-induced alleviation of seed germination inhibition was significantly blocked by the addition of cPTIO and PTIO, respectively (Fig. 3). The cotreatment with PTIO suppressed the inducible effect of SNP on the alleviation of seed germination inhibition as well. The additive behavior appeared when CH4 was added together with SNP followed by stress. These results, together with the performances of old SNP (Fig. 3), suggested the importance role of NO in the beneficial responses triggered by CH4. In view of the relative expensive price of cPTIO and higher amount of scavenger required for a fully assay, we adopted PTIO as a NO scavenger in the subsequent investigation. To investigate the mechanism of CH4-alleviated seed germination inhibition, several physiological parameters, including reducing and soluble sugar contents, α-amylase and total amylase activities, were detected. As shown in Table 1, PEG stress for 48 h resulted in obvious decline of those parameters in germinating seeds. The combination of PEG with CH4 or SNP pretreatment enhanced α-amylase and total amylase activities, both of which were in accordance with the increased contents of reducing sugar and soluble sugar. On the contrary, above changes in starch metabolism triggered by CH4 and SNP were impaired by the addition of PTIO. Alone, PTIO decreased above parameters, suggesting the possible role of endogenous NO. In order to assess the role of NO in the physiological role of CH4, endogenous NO levels in root tissues were checked by using the permeable NO-sensitive fluorophore 4-amino-5-methylamino-2’7’-difluorofluorescein diacetate (DAF-FM DA) in combination with laser scanning confocal microscopy (LSCM). We compared fluorescence detected in the presence of SNP, old SNP, and PTIO. As expected, in the presence (in particularly) or absence of PEG stress conditions, SNP-induced fluorescence was differentially reduced when root tissues were co-pretreated with PTIO (Fig. 4a, b). Unlike SNP, old SNP failed to influence PEG-induced DAF-FM DA green fluorescence. Under osmotic stress conditions, the CH4-triggered induction of DAF-FM DA fluorescence was markedly abolished by the removal of NO with PTIO, suggesting that above strengthened-fluorescence was NO-specific (Fig. 4a, b). The obtained data with Griess reagent assay (Fig. 4c) were in line with those of DAF-FM-associated fluorescence, further confirming that the DAF-FM-dependent fluorescence was related to NO levels in vivo. Combined with corresponding phenotypes (Fig. 3), these result apparently supported the idea that NO production might be involved in CH4-induced tolerance against PEG stress. To better characterize the main source(s) of NO generated by CH4 in stressed mung bean, seeds were pretreated with chemicals that interfere with NO production before osmotic stress. In our experiment, tungstate and L-NAME were used. Tungstate is the inhibitor of NR , and L-NAME is the inhibitor of mammalian NOS, which was usually applied to inhibit plant NOS-like activity [39, 49]. As shown in Fig. 4d, tungstate significantly blocked CH4-alleviated seed germination inhibition, suggesting that CH4-triggered NO production might be partly resulted from NR. Comparatively, L-NAME had a lesser, yet significant influence on the CH4-triggerd response, implying that NOS-like enzyme might be partly involved. Upon stress conditions, redox homeostasis is impaired, and NO-mediated plant tolerance against stress is normally associated with the reestablishment of redox homeostasis . To further investigate the mechanism of CH4-elicited tolerance against osmotic stress, we analyzed whether redox homeostasis was involved, in a manner similar to NO response. Sections detached from root tips were stained with H2DCF-DA (a probe for ROS), and LSCM was used to check changes in intracellular ROS levels (Fig. 5a, b). As expected, ROS overproduction occurred when PEG was supplemented, confirming that redox imbalance happened. PTIO alone induced redox imbalance as well. Further results revealed that PEG-triggered redox imbalance was markedly blocked by the addition of CH4, which was abolished by PTIO. Similar responses were observed when SNP was applied. Above results suggested that CH4-modualted redox homeostasis was sensitive to the removal of endogenous NO. To confirm above deduction, a histochemical staining by Schiff’s reagent, which is used to monitor the level of peroxidation of membrane lipids, was performed (Fig. 5c). Compared with the control samples, the roots of mung bean treated with PEG alone or pretreated with PTIO alone were stained extensively. Those pretreated with CH4 or SNP followed by stress showed a less staining, which were markedly reversed when PTIO was cotreated together. Meanwhile, changes in TBARS contents exhibited the similar tendencies (Fig. 5d). To further understand the possible role of CH4 in protein level, the NO-mediated S-nitrosylated protein level was detected by using the protein extracted from mung bean and the modified biotin switch assay. Fig. 6 showed that similar to the responses of SNP alone, stress stimulated nitrosylation, which was strengthened by CH4 or SNP. By contrast, above CH4- or SNP-stimulated nitrosylation in stressed plants were obviously abolished when endogenous NO was removal with PTIO. Alone, the pretreatment with PTIO could decrease nitrosylation levels in the presence or absence of PEG. Here, we provided the molecular basis of CH4-induced plant tolerance against osmotic stress: the involvement of NO signaling. Similar to our previous findings in maize root tissues upon osmotic stress , this report revealed that an increase in the concentration of CH4 is one of the earliest responses involved in the signaling cascade triggered by PEG stress in germinating mung bean seeds (Fig. 1). Although the biochemical routes responsible for plant CH4 production have not elucidated in this report, our finding that PEG triggered CH4 production was in agreement with those obtained in germinating alfalfa seeds subjected to copper stress  and salinity . Combined with the results showing that osmotic stress obviously increased CH4 emission in pea leaves , and CH4 might be associated with adventitious rooting in cucumber [38, 39], we therefore deduced that CH4 might be produced and then emitted by plants as a consequence of osmotic stress, and this might be a universal event, or stress- and even developmental stage-specific in different plant species. The possible role(s) of endogenous CH4 production was subsequently investigated in PEG-stressed mung bean. 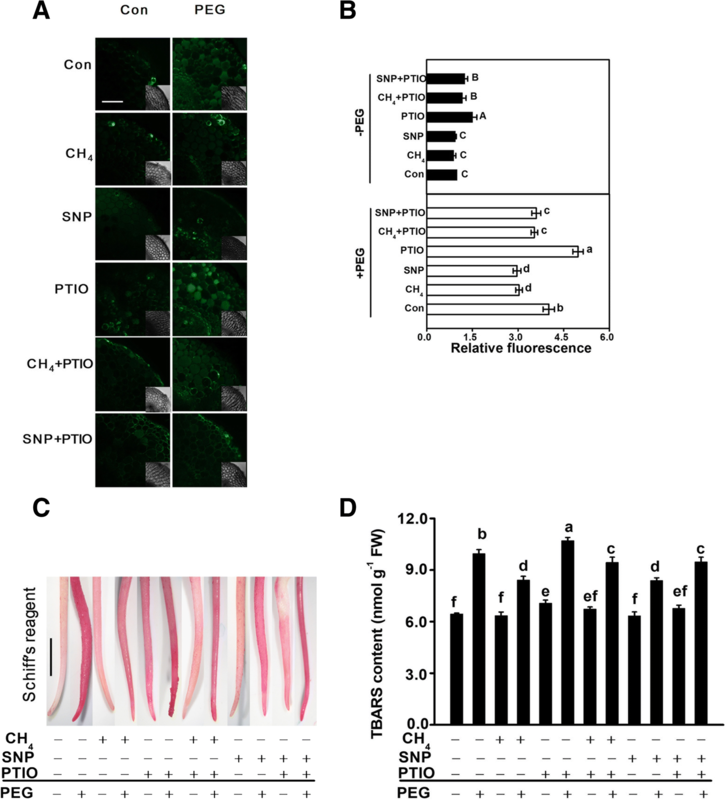 The physiological function of CH4 was firstly recognized in animals , showing that it displays the protective response against the intestinal ischemic/reperfusion (IR) injury-induced oxidative stress and inflammation. Until now, it was recognized that CH4 serves as multiple functions in animals via anti-oxidative, anti-apoptotic and anti-inflammatory actions [30, 32, 51]. Similar to the beneficial roles of NO against osmotic stress and drought in plants [17, 18], by using culture solutions containing different concentrations of CH4, we provided evidence, showing that CH4 could participate in the promotion of plant tolerance against osmotic stress in mung bean during germination. First, PEG-induced inhibition of seed germination was alleviated by CH4 in a dose-dependent fashion, with 1.3 mM in maximum response (Fig. 2a). Above beneficial role could be explained by CH4-induced α-amylase and total amylase activities, thus accelerating the formation of reducing and total sugar (Table 1). These results were consistent with our recent report , showing that PEG-induced CH4 production was more pronounced in the drought stress-tolerant maize cultivar than stress-sensitive cultivar. Our subsequent experiments confirmed that the main factor of CH4-rich solution responsible for the alleviation of seed germination inhibition was the dissolved CH4, rather than hypoxia (Fig. 2b). Similar results were confirmed in hydrogen-rich water-mediated tolerance against drought in Arabidopsis . In view of the fact that the inhibition of seed germination is one of the representative phenotypes in response to osmotic stress, we therefore confirmed that CH4 enhances plant tolerance against osmotic stress. Similar rescuing responses in salinity  and heavy metal stress  were previously reported, although the specific mechanisms are still not fully elucidated. It has been well documented that gaseous signaling molecules have not only discrete, but also overlapping roles in conferring plant stress tolerance [11, 17, 25]. In the subsequent work, we confirmed that the beneficial roles of CH4 are, at least partly, dependent on the action of NO, a well-known gaseous signaling molecule in plants [16, 23]. First, CH4 strengthened the increase in NO production in roots upon PEG stress (Fig. 4a–c). Above mentioned CH4-triggered NO production was markedly impaired by the addition of PTIO (a scavenger of NO), which was confirmed by the combination of LSCM and Griess reagent assay. Similar phenomenon occurred when SNP was applied in the presence of PEG and PTIO. Meanwhile, related phenotypes in terms of the alleviation of seed germination inhibition (Fig. 3) and corresponding parameters (Table 1) were reversed. Third, unlike the responses of SNP, old SNP failed to influence above parameters. These results, together with our previous results , suggested the novel function of NO in the beneficial roles of CH4 in stressed conditions and different developmental processes. Additionally, the possible involvement of NR and NOS-like protein in CH4-induced NO production was preliminarily corroborated by the findings that corresponding inhibitors (tungstate and L-NAME) inhibited CH4-alleviated seed germination inhibition caused by PEG (Fig. 4d). In fact, the contribution of NR is very difficult to evaluate in our experimental conditions, since tungstate, an inhibitor of NR, is also a ABA synthetic inhibitor. Thus, further genetic evidence should be considered. Certainly, other route(s) responsible for NO production might be another consideration. Keeping redox homeostasis is an important mechanism for plant tolerance against osmotic stress . Upon PEG stress, redox imbalance occurred. For instances, PEG stress could obviously induce ROS overproduction (Fig. 5a, b) and oxidative damage (Fig. 5c, d). These responses could be alleviated by CH4. It was further observed that CH4-reestablished redox balance was NO-dependent, since PTIO could counteract the effect of CH4. Together, above results indicated that CH4-evoked endogenous NO production in mung bean was positively correlated with plant tolerance against osmotic stress, and the reestablishment of redox homeostasis was an important mechanism. It was well-known that NO-based S-nitrosylation is a highly conserved protein posttranslational modification that regulates diverse biological processes . To further confirm the role of NO in the actions of CH4, the combination with pharmacological approach and biotin switch method was used (Fig. 6). Consistent with the previous results in cucumber explants , our results suggested the role of NO-mediated S-nitrosylation in CH4 responses, which might be in a stress- and development-specific fashion . Taken together, our results define a main branch of NO-regulated redox homeostasis and starch metabolism involved in the CH4 signaling cascade during plant tolerance against osmotic stress (Fig. 7). CH4-governed NO-mediated S-nitrosylation might be an interesting mechanism. Therefore, the identification of NO-targeted nitrosylated protein(s) by using nanoLC/MS/MS might help us to understand the detailed mechanism of CH4 action. This work was financially supported by the Postgraduate Research & Practice Innovation Program of Jiangsu Province (KYCX17_0660), the Fundamental Research Funds for the Central Universities (KYTZ201402), the China Agriculture Research System (CARS-08), and the Priority Academic Program Development of Jiangsu Higher Education Institutions (PAPD). YZ1, WS and YZ2 conceived and designed the study. YZ1, JS, DC, RW, YM and HH participated in acquisition of data for the study. YZ1, WS and YZ2 analyzed the data. All authors read and approved the final manuscript.